OSU Extension Educator, Carri Jagger at right, looks over the plants brought in by Master Gardeners for the “plant swap’ after the August garden class. 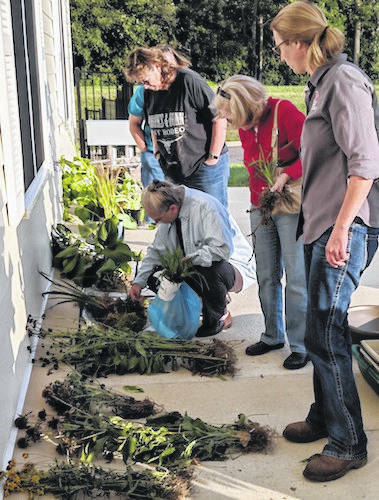 MOUNT GILEAD — The Morrow County Master Gardener Volunteers enjoy sharing both knowledge and plants. They not only have classes on gardening, but often organize a “plant swap” where they exchange plants along with information on growing them. Master Gardener participant Joanne Trainer said that there is a “wealth of knowledge available” in classes offered by The Ohio State University (OSU) Extension with Carri Jagger. Trainer said she has learned a great deal this year from Jagger and also from others in the classes who share their knowledge and tips on gardening. Jagger said this is the second group of Master Gardeners that she has worked with in Morrow County. There were seven in 2017 who were in the program. This year nine registered. There are also many who attend garden classes without signing up for the entire program. Topics for garden classes this summer included: “Container and raised bed gardening,” “Fall is for planting” and “Mini-gardens.” Jagger gave tips at the August class on the fall planting season for various plants and bulbs. Garden tool maintenance was discussed as experts sharpened shovels, trowels, clippers and other tools. Jagger said Master Gardeners share their love of gardening while giving back to the community. She was glad to report that 207 pounds of fresh vegetables were donated to Morrow County food pantries by the volunteer gardening classes this summer. Gardeners in the program receive training in the spring in horticulture from OSU Extension in the areas of botany, soils, trees, flowers, lawns, fruits, vegetables, entomology, pest management and diagnostic skills. Trainees must complete a minimum of 40 hours of training. After training, new volunteers work with each other in various activities to meet 50 hours of service their first year. Much more information is on the website: www.morrow.osu.edu. The last two classes in the 2018 Garden Series are: “Putting your garden to rest” on Oct. 17th and “Wreath make and take” on Nov. 14. Classes are held at the Morrow County Extension Office at 5362 U.S. 42, Mount Gilead, in the upstairs classroom at 6 ­p.m. For information about the Master Gardener program or classes contact Carri Jagger, 419-947-1070, or Jagger.6@osu.edu and www.morrow.osu.edu.